Portrait at the Conde Nast International Mindful Luxury Conference in Oman, Muscat, 2017. Daou designs blur the boundaries between contemporary and classic. Creating collections of statement poetic jewels and playful delicate jewellery pieces, as well as bespoke jewels for clients’ engagement and wedding rings, special occasions and also men’s jewellery. Award winning London born owner and jewellery designer Dalia Daou has taken her Daou surname meaning ‘light’ as touchstone for creating jewellery which plays with light, its literal and emotional interpretations. Designs inspirations come from science and geometry, art, fantasy and femininity with selected influences refreshed from a timeless Daou design archive. 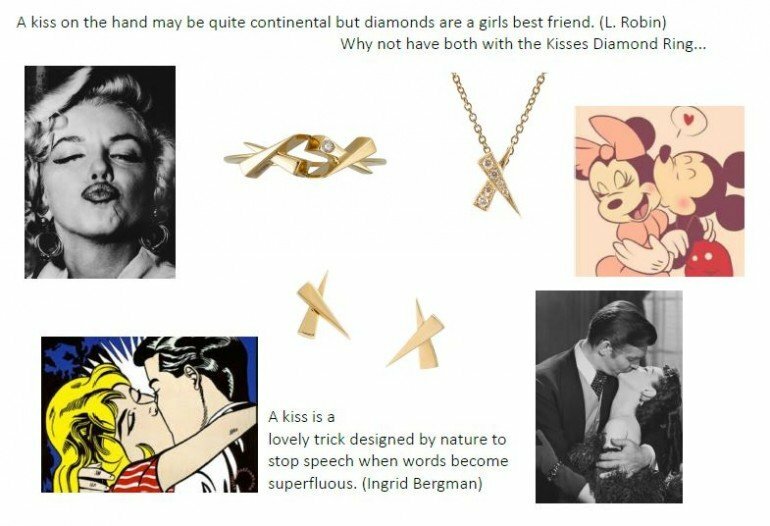 Revived by Dalia who is a third generation jewellery designer, Daou jewellery has an interrupted international history from the ‘30s, then ‘60s and ‘70s which saw Daou honoured by a royal appointment and chosen by screen sirens such as Princess Grace Kelly and Brigitte Bardot. An illustrated timeline of Daou history can be seen below. Combining GIA gemology training with a Physics education and a lifetime of art practise and familiarity with fine jewellery Dalia’s designs are conscious of all the aspects that make fine jewellery a beauty to wear as well as behold. Her Majesty The Queen of England, Elizabeth II viewed Daou jewellery and met Dalia Daou at London Fashion Week February 2018. Dalia was invited by international VOGUE editor Suzy Menkes to speak at the Conde Nast International Luxury Conference 2017; has won the New Designer of the Year 2016 at the UK Jewellery Awards; and a place on the British Fashion Council’s Rock Vault. Daou jewellery has been featured internationally in such publications as VOGUE, TATLER, GRAZIA, Wallpaper*, and COUNTRY & TOWNHOUSE. 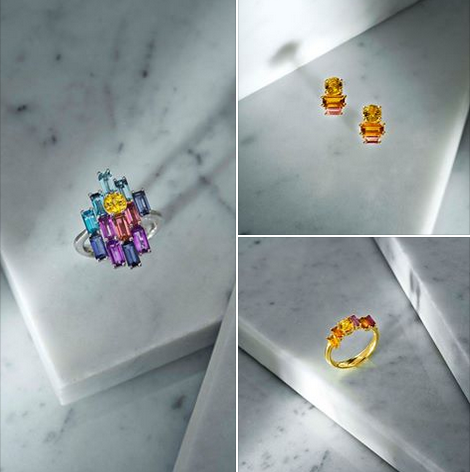 Daou jewellery is currently stocked at Liberty of London, the prestigious department store is renowned for its jewellery selection and perfect for Daou jewellery with both combining fine heritage and beautiful contemporary design. Georges Daou opens BIJOUX DAOU. 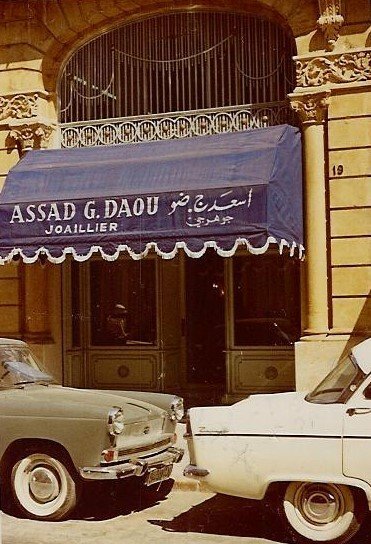 A.G. Daou, Georges Daou’s son, opens his first boutique in a prime location on Avenue des Français, a beautiful wide boulevard by the coast often referred to as the Bond Street of Beirut. Daou designs have been sought after for their beauty, colour, life and innovation; inspired by nature, colour and form for three generations. 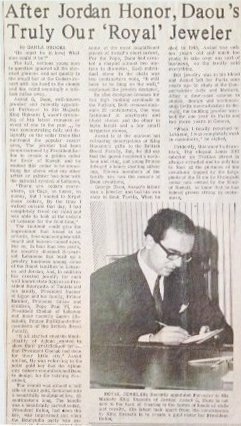 The Royal appointment of Daou jewellery to King Hussein of Jordan. Queen Elizabeth II is gifted with jewellery by Daou. Brigitte Bardot visits the Daou boutique. 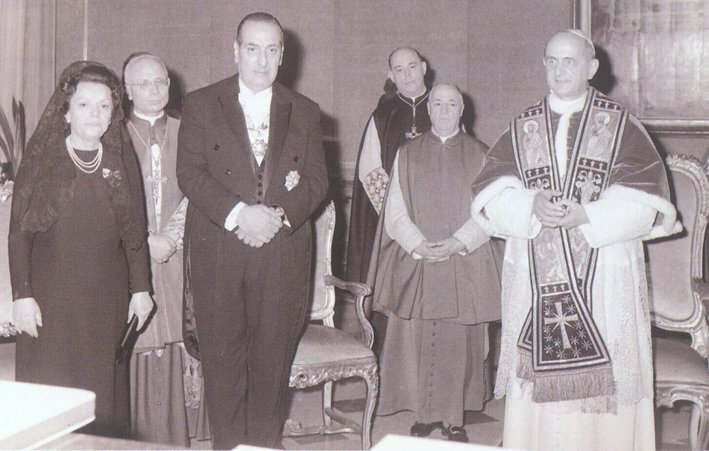 The private audience granted by His Holiness Pope Paul VI at the Vatican in Rome. Lebanese President Charles Helou and his wife Nina offer a gift made by A.G. Daou. 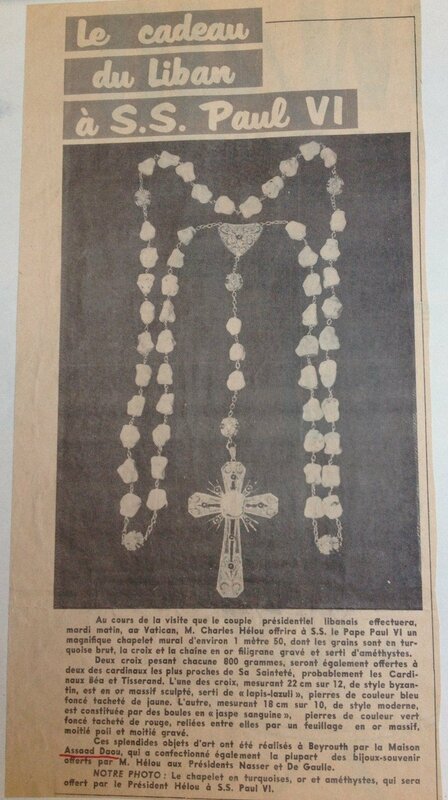 The gift of a decorative cross for His Holiness Pope Paul VI created by A.G. Daou. 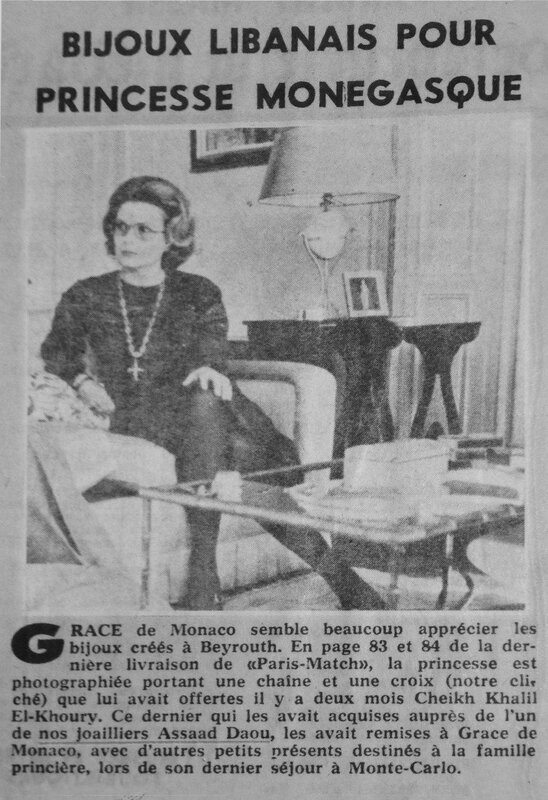 The Princess of Monaco, Grace Kelly, wears Daou jewellery. 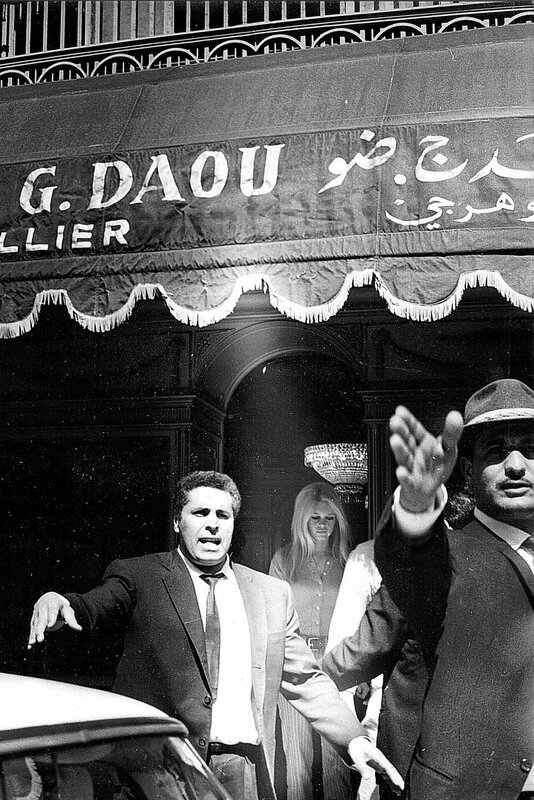 The second year of the Lebanese Civil War (1975-1990) claims the Daou boutique in Beirut. 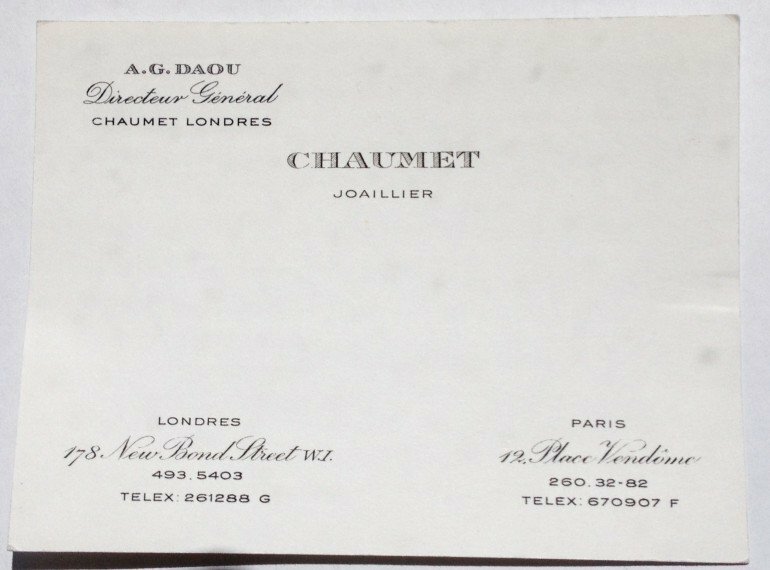 A.G. Daou moves to London after being appointed the managing and creative director of Chaumet on Bond Street, London. 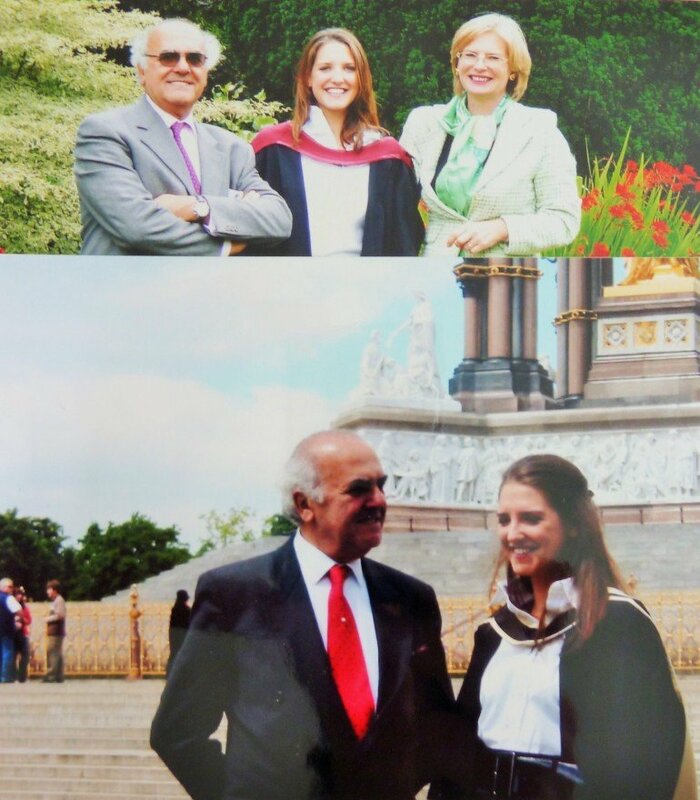 A.G. Daou’s daughter is born and raised in London surrounded by art and creativity leading to art and sculpture studies at Wimbledon College of Art and l’École Nationale Supérieure des Beaux-Arts in Paris. Dalia Daou graduates in Physics from the University of Bristol; and a Masters in the History of Science, Medicine and Technology from Imperial College London. 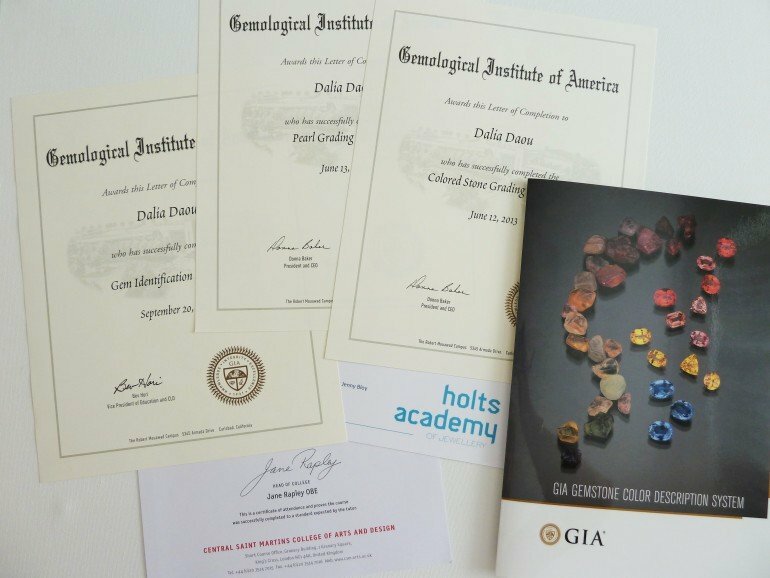 Studies that are still relevant to Dalia in the technical and detail oriented aspects of gemology and jewellery creation, and a wealth of inspiration from a deeper understanding of the beauty of the natural and physical world. Dalia worked for a short time in New York in luxury PR, followed by financial portfolio risk consulting in the City of London prior to jewellery. Dalia Daou trains in jewellery techniques and processes in London’s Hatton Garden, Holts Academy of Jewellery and at Central Saint Martins. 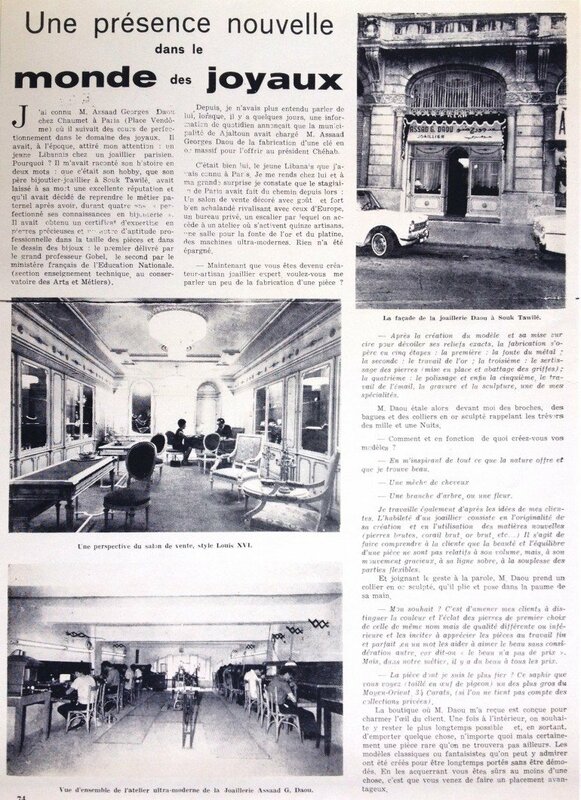 As well as gemstone studies at the Gemological Institute of America. 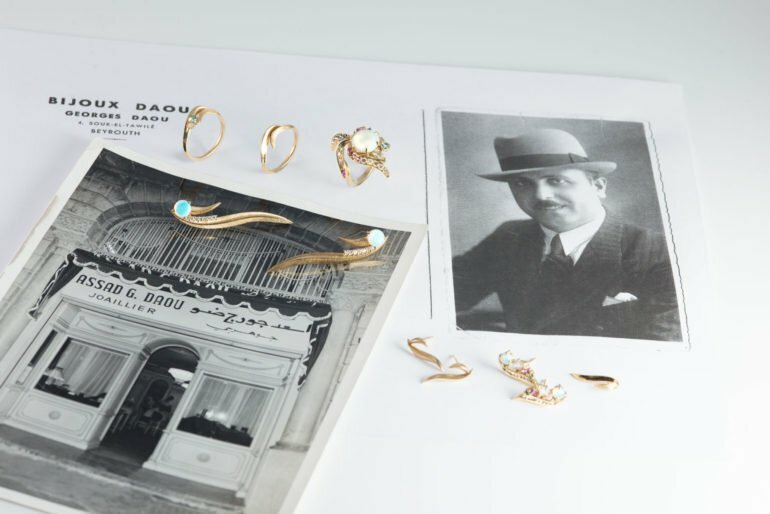 Dalia Daou reopens Daou Jewellery in London. 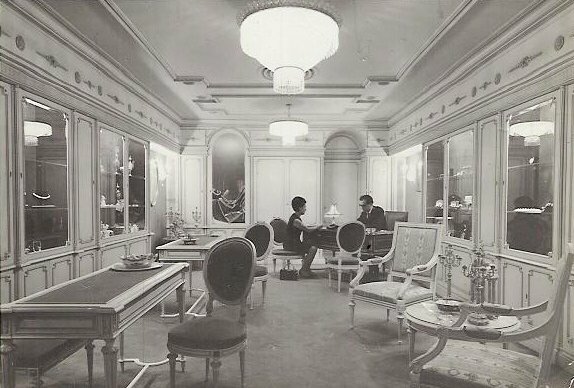 Daou means ‘light’, and in reference to the 1930’s heritage, the light is returned in a contemporary Art Deco style jewel inspired by science, sentiment, and Daou archives. 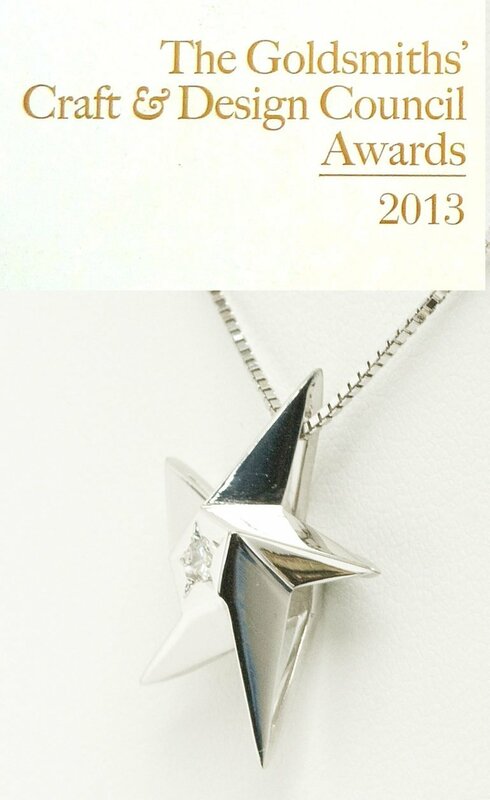 Dalia Daou debuts the Star design at the Goldsmiths’ Craft & Design Council Awards in London. Daou launches the Sunset Sunrise collection. Illustrated in modern impressionistic designs with depth and multi-dimensional angles catching the light and refracting the vibrant fusion of hues in the beautiful baguette gemstones, specially hand selected and arranged to represent the emotive sunset and sunrise. Daou launches the Quanta collection at London Fashion Week. An understanding of subatomic particles from studies in Physics have led to a series of designs that can be brought together to create original jewellery combinations of colour and shapes which the wearer can experiment with, just as particles combine to form atoms and all the beauty that exists. 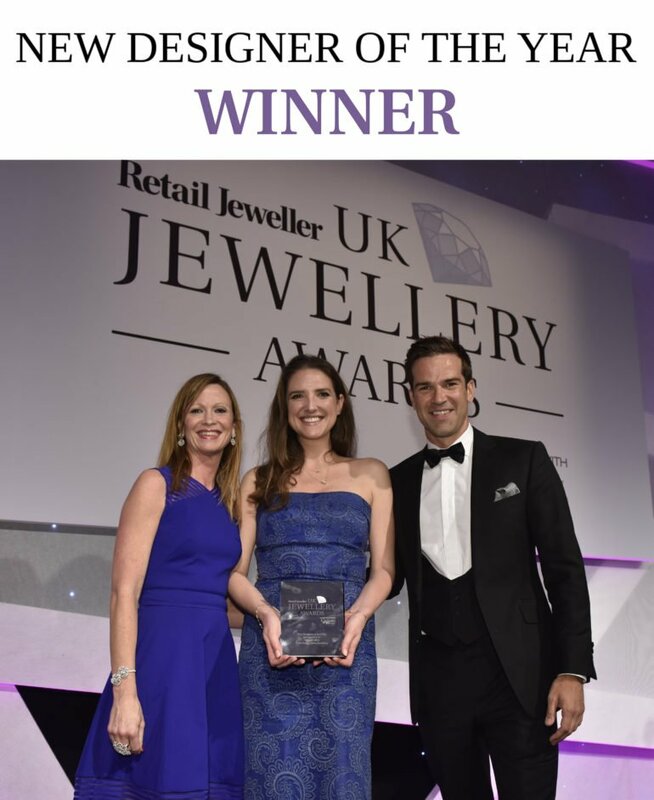 Daou Jewellery and Dalia Daou receive Membership to the British Jewellers Association later renamed the National Association of Jewellers, a mark of trust and quality. 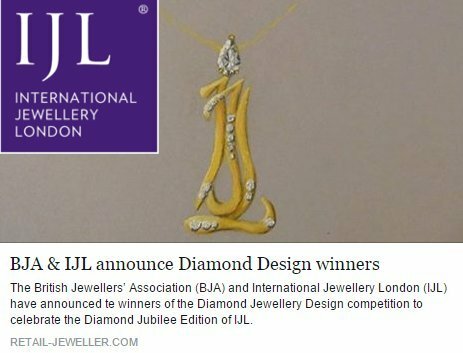 Daou Jewellery exhibits at International Jewellery London in the Designer Gallery, securing a number of new stockists and this Daou pendant design is Highly Commended in the BJA IJL 60 points for 60 years Diamond Design competition. 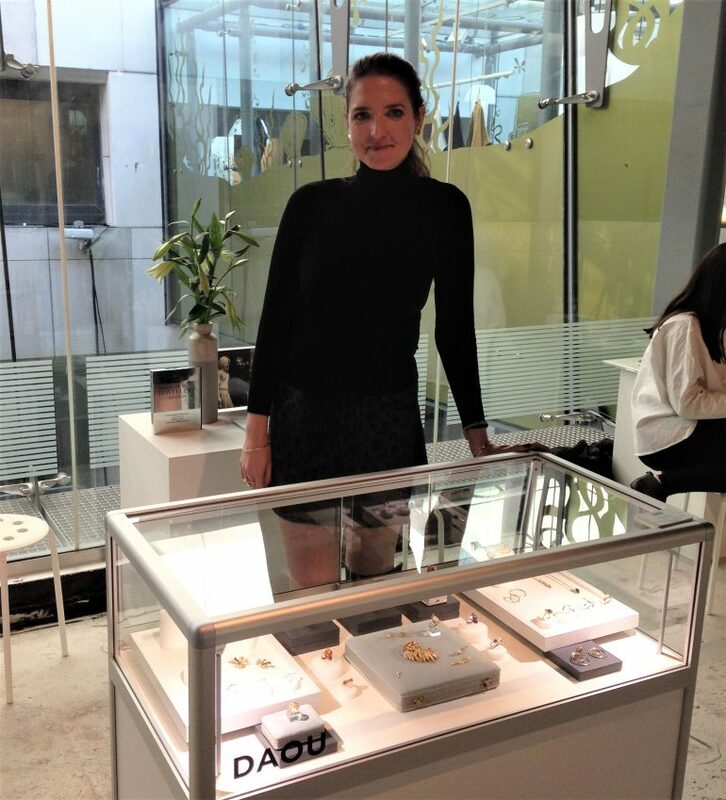 Daou Jewellery presents new collections at the official London Fashion Week British Fashion Council Designer Showrooms. www.londonfashionweek.co.uk Read more here on the blog. Daou selected for BFC ROCK VAULT Daou is one of two new designers to join the 4 members of the prestigious British Fashion Council fine jewellery initiative ROCK VAULT created with Stephen Webster. 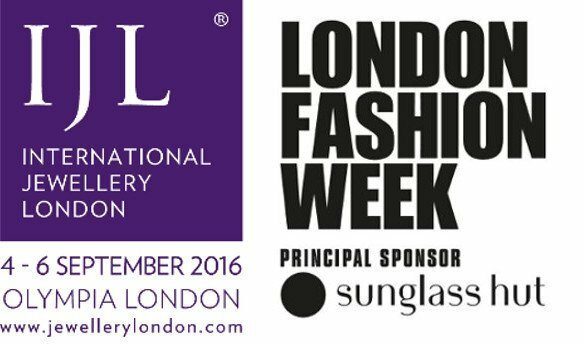 The first event as part of Rock Vault will be the showcase at London Fashion Week in September. 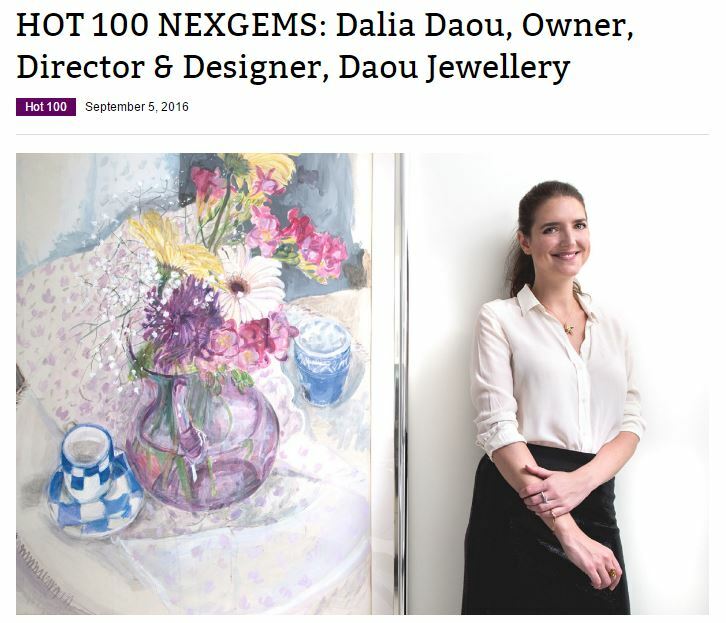 Dalia Daou is awarded a place on the Professional Jeweller Hot 100 roster of jewellery industry players making waves in 2016. 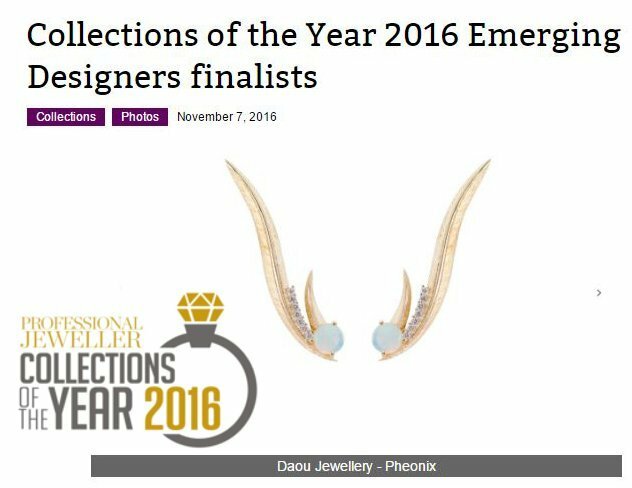 This makes a hat trick of awards for Daou Jewellery in 2016. 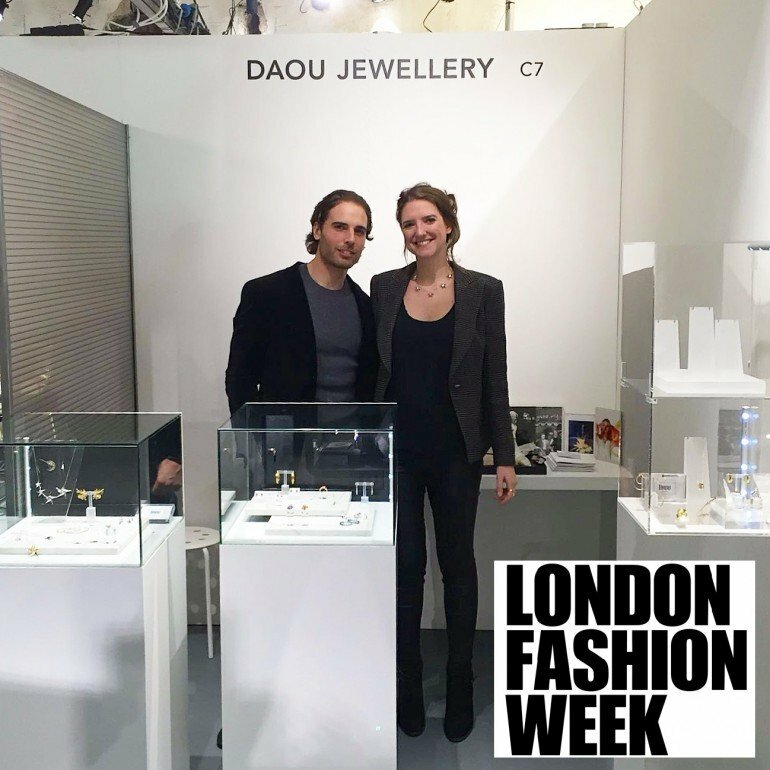 Daou Jewellery shows at both International Jewellery London and London Fashion Week for the second time. Showcasing with a higher profile and and presenting key pieces as well as the new Phoenix collection. For more images see the News coverage here. Signifying renewal, resilience, rarity and femininity the Phoenix collection also tells the story of reigniting Daou Jewellery which is visualised in the collection imagery. Designs are inspired by the exquisite forms of birds of paradise and the legendary Phoenix fire-bird referencing flickering flames and the movement of feathers. The collection also features a return to imaginative use of coloured gemstones combinations and signature Daou play of light with hand-selected fine opals. The new Phoenix jewellery collection is shortlisted as a finalist for the Collection of the Year 2016. 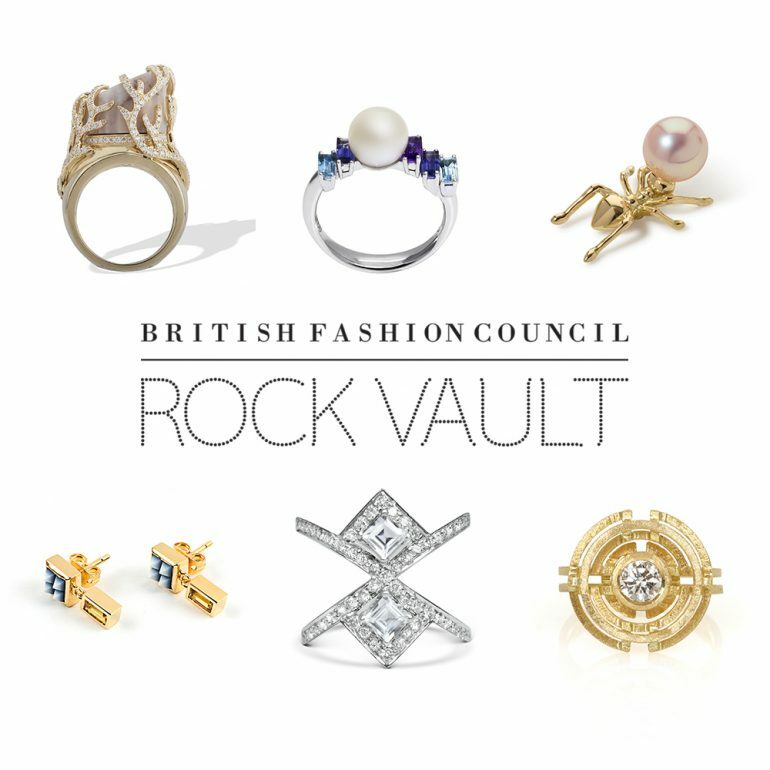 Daou Jewellery shows at London Fashion Week as part of the British Fashion Council Rock Vault fine jewellery selection. Presenting key pieces and telling the heritage story through designs. For more images see the News coverage here. 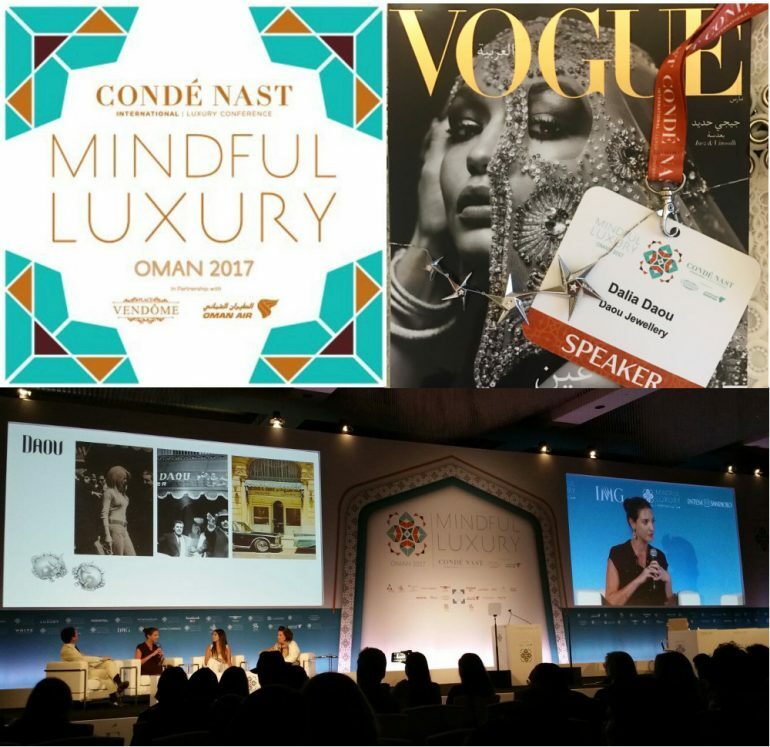 Dalia Daou, Daou jewellery designer is invited by Vogue International Editor Suzy Menkes to speak at the Conde Nast International Luxury conference in Muscat Oman among many illustrious luxury industry players from group CEOs to creative directors and couture designers of the world’s largest designer brands. Read more in the press coverage here and image gallery here. Truly an honour. 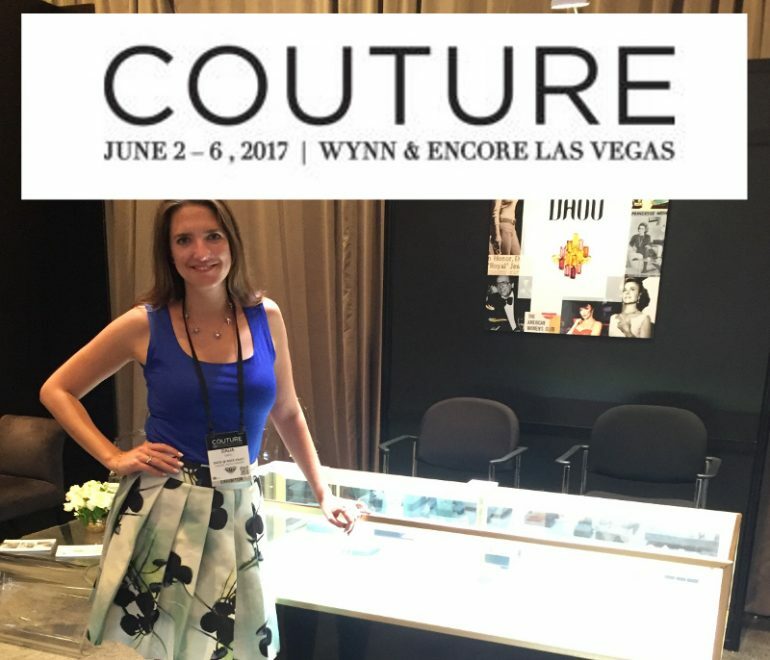 The fine jewellery Couture show in Las Vegas, USA is the premier American jewellery exhibition. Daou jewellery displays with a stand beside Stephen Webster and Rock Vault. 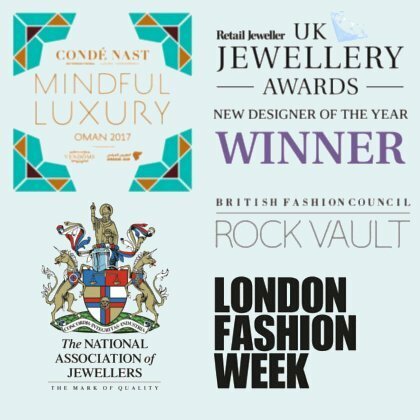 Daou Jewellery shows at London Fashion Week again as part of the British Fashion Council Rock Vault fine jewellery selection in September 2017. Her Majesty The Queen is pictured talking to Dalia Daou as she presents her jewellery at London Fashion Week 2018. 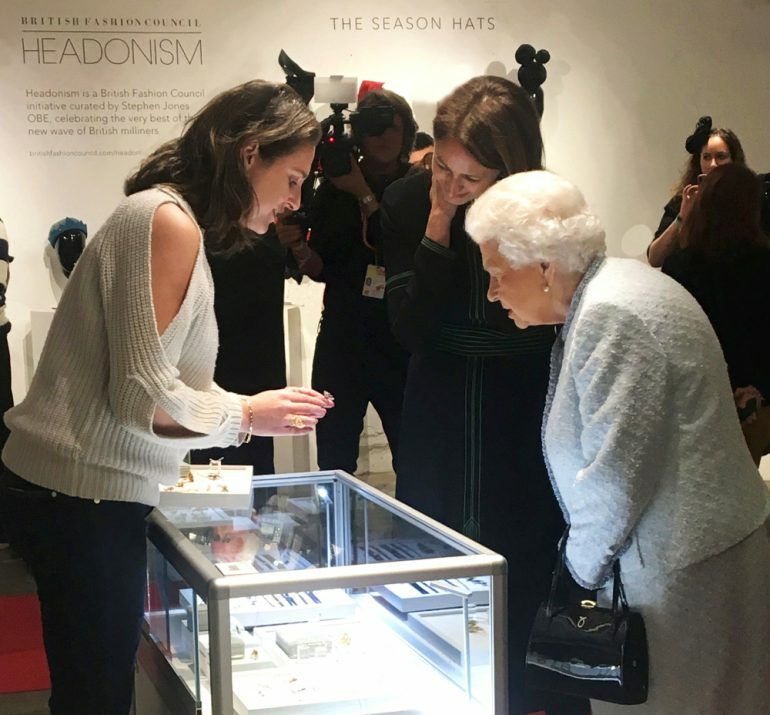 The Queen complimented Dalia’s designs ‘How lovely!’ and Dalia told Her Majesty of how Daou jewellery is in The Queen’s own collection commissioned as a gift presented on a state visit in the 1960s. See earlier in the timeline and more about The Queen’s visit here. The British Fashion Council hosted Queen Elizabeth II at the Designer Showrooms and Richard Quinn fashion show for the Queens Award. 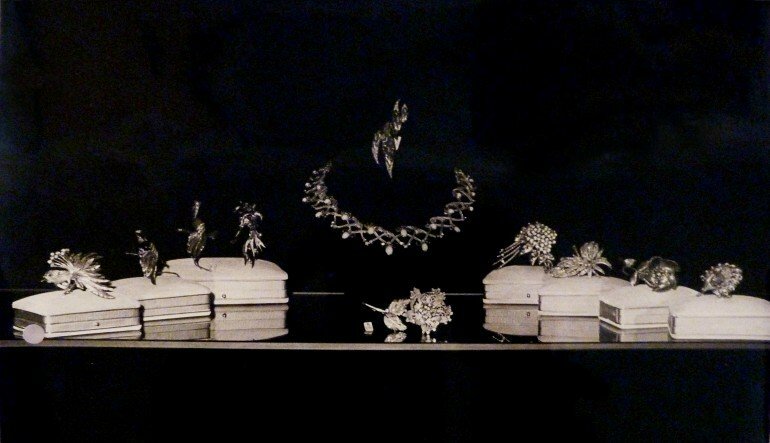 Proud to announce Liberty London now stocks Daou jewellery within its exceptional renowned jewellery hall. Please visit the beautiful department store between Regent Street and Carnaby Street in London’s West End to see and shop the collection edit. 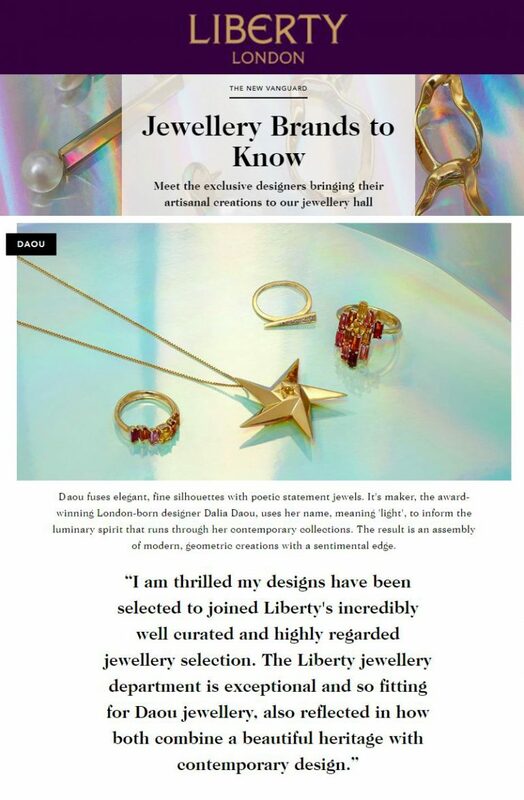 Read here for the Liberty introduction to Daou jewellery in their magazine, client email and online shop.